In 1947, Johnny Goodpaster saw an old Harley-Davidson for sale in someone's front yard for $75.00. After inquiring, he found out the hog didn't run and was missing a key ingredients. Being a pretty good mechanic with almost enough money, he planned on buying it with the intention of fixing it up and selling it for a profit. Two days later he bought the bike and it didn't take him long to get it running. It was rough, but it ran strong. After about a year of nursing it along, he was able to sell it and get all his money back and then some. With pride he then used his profit to purchase a more current model Harley-Davidson. In 1949, he rode the aforementioned bike up to Lansing, Michigan and raced it in the Jack Pine, a 500 mile National Enduro. After successfully finishing the race, he hopped back on and rode it all the way home. The whole ride back he thought about those riders on the newer, lightweight British bikes that kept passing him in the woods, and what it would take for him to get one. After a little research, John found out that if he bought two B.S.A. 's and a small parts package he could sell those and become a dealer. With his enthusiasm and new found salesmanship, he convinced a friend to buy one right away. It didn't take long and he became an Authorized B.S.A. Dealer. After John sold his Harley and bought another B.S.A., he nailed a sign on his attached garage that said B.S.A. Sales and Service. It was 1950, and the beginning of Expert Motorcycle Works. After four more years and five more kids, it became obvious that he was spending too much time at home. With the business flourishing, and in such cramped quarters, he started thinking about a new location. It took a few years, but by working two jobs and running the bike shop, he was able to save enough money to buy a building in nearby Hobart, Indiana. Expert Motorcycle Works still operates at that location today. Through the 1950's, Goodpaster continued to participate in Enduros, Flat Track, Moto-cross, Road Races, Ice Races, plus 17 more Jack Pines; and he did it all on B.S.A.s. While this was all going on, one of his boys couldn't stay out of the garage or away from the bikes. 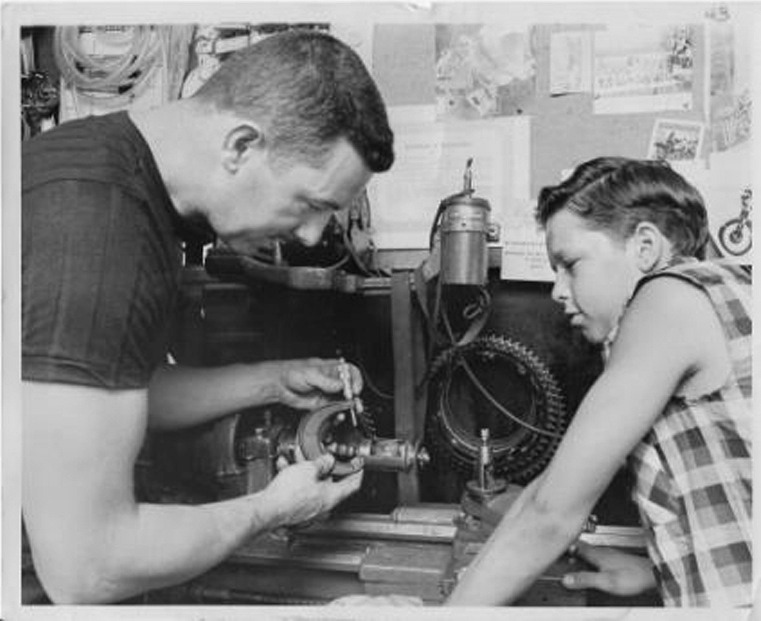 By the time Bob was seven years old he was working in the shop, and went on working and racing with his dad for the next forty-five years, until John retired in 2003. During this time, Expert Motorcycle Works sold B.S.A., Triumph, Norton, Ariel, Montesa, Bultaco, BMW, Bennelli, Husqvarna, Maico, Rickman, and Suzuki. Over time, their specialty became working on B.S.A., Triumph, and Norton motorcycles, which John and Bob dealt until they went out of business. B.S.A. in shut its doors in 1972, Norton followed not long later in 1975, and the last Triumph was rolled out of the factory in 1983. Today, Bob and his wife Yvette own and operate Expert Motorcycle Works, and exclusively service and restore B.S.A., Triumph, and Norton Motorcycles.